One of the great things about travelling in our motorhome RoadAbode is being able to camp only a short distance from the most beautiful areas Pennsylvania has to offer. Depending on schedule, weather, or mood, we can do an eye-opening morning, leisurely afternoon, or a starlight evening hike. The timing doesn't matter; RoadAbode as our base camp is right there to afford all the comforts of home, because well, she is our home! Here's a list of five favorite places to hike in PA. We're sure you have your favorites too, and we'd love if you could share and discuss your hiking places and tips in the comments section below. French Creek HAS to be on our short list of hikes, because it holds fond long-ago memories of traveling with parents. Measured at 7,730-acres, it is the largest block of contiguous forest between Washington D.C. and New York City. Only an hour from Philadelphia, this wooded area off Route 23 in Elverson PA was as far as my parents liked to travel for a day trip. Now for our family of four, camping with RoadAbode for a few nights blesses us with time to relax, fish, canoe, and still get to see plenty of what the area has to offer. French Creek State Park has it's own multi-looped campground. Some sites are only for tenting, but most have electric hookups. Water is available at strategic locations on each loop, so as you come in, make sure to top off your RV's fresh water tank. If you come with fido, there is a loop of designated campsites for those with pets. A modern playground is right in the campground, and a swimming pool is a short drive or nice hike on the other side of Hopewell Lake. There are also Yurts and Cabins, if you have friends that don't RV you want to include in your adventures. Reservations are recommended for all accommodations. There are multiple trails that crisscross the park. Horses are permitted on the Horse-shoe Trail and bikes are prohibited on trails south of Park Road. This makes for time of reflective hikes or fun group hikes without worry. Leashed pets are allowed on all the trails. The trails are well marked, and for the most part well maintained. Sturdy soled sneakers, shoes, or boots are smart - flip-flops are not. Cool Trail Tip: For hiking right from your campsite there are at least four enjoyable trails to choose which pass right by the campground. Here is one personal favorite which is not too long. Start by hiking from the campground, following down the entry road. You should be able to see the trail off the road, a little past the campground's check-in station. Enter the trail on the left where the Boone trail (blue blazes) and Lenape trail (green blazes) intersect. Follow the Lenape a short way. The Colliers trail (white blaze) will be available for you there. This trail will take you south toward the dam of Hopewell Lake then west, toward Hopewell Village National Historic Site, a restored Colonial era Iron Forge village. If you go in autumn. you may be able to pick heritage apples there! For more about French Creek, check the PA DCNR site. 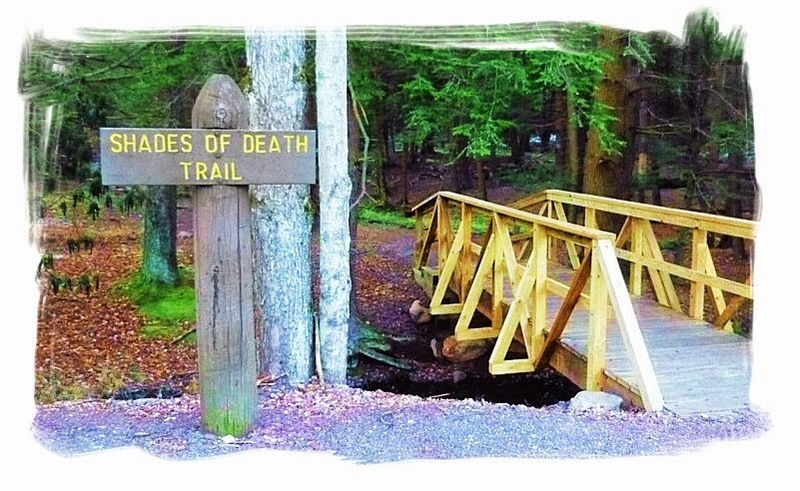 This State Park wins for best named trail: "Shades of Death Trail" The best part is, it's not deathly at all - it's a shaded hike by swift moving water - and a really great place to trek into. Hickory Run State Park is located in the part of Pennsylvania known as the foothills of the Pocono Mountains. It borders the Leigh River on its western boundary. 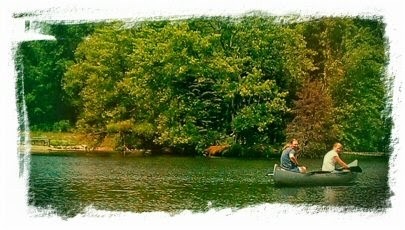 Besides hiking, Hickory Run is a great place to camp, fish, and swim. One thing the park is know for is the oddity of Boulder Field, formed by the most "recent" glacial period, approximately 20,000 years ago. Boulder Field is registered as a National Natural Landmark. Cool Trail Tips: The Shades of Death Trail follows along the Sandy Spring Run, and is the most picturesque trail in the park. Sandy Run flows and meanders through a thicket of Hemlock and rhododendron woodland. Wear good footwear that's water resistant, because there are plenty of tree knots and roots to trip over in a slightly swampy section of the trail. Get past the challenge and be rewarded with a hike up a set of steps carved into the rock outcropping. Once you reach the top, have a bit of fun with a chance to make your own cairn, atop this sunlit and moss covered rocky plateau in the forest..The stacked rocks are as much trail marker as they are art. Respect and admire the ones already there! Some sections of this trail are steep. The chance to relax next to the stream, or gaze up at the water flowing off of the CCC made dams are worth the extra effort. You can find the trail-head by the park office on Route 534 across from the chapel. There's something about the sounds and scents near falling water that makes a hike more relaxing. Ricketts Glen State Park is home to the Glen Natural Area. Here, branches of Kitchen Creek create over twenty named waterfalls flowing through Ricketts, Ganoga, and Leigh Glens. The Kitchen Creek branches form the Ganoga and Leigh Glens, and come together to form Waters Meet, a swirly whirlpool of water. The waters continues cascading down through Ricketts Glen. The waterfalls range in height from nine feet to over ninety, The trail follows along the waters, through the three glens which make-up the park land. Absolutely one of the most beautiful places on the east coast, the PA Bureau of State Parks named Rickets Glen State Park a top "Twenty Must-See Pennsylvania State Parks"
The campground at Rickets Glen is beautifully laid out, with picturesque sites situated alongside Lake Jean. The campground does come with a few caveats for RVers use to having all the comforts of home. The restrooms are modern and clean. However, there are no hookups at the individual campsites, not even electric. 2015 will add new cabins to those already existing. The cabins all have electric, however the newer buildings will not have running water. To get to the campground, RVers will need to be careful with the roads they use. The road entering the park from the south, using Route PA-118 to Route PA-487 North,. is too steep and not recommended for RVs of any size. The recommended route is entering from Dunshore, PA, going South on PA-487 for anyone with a RV. 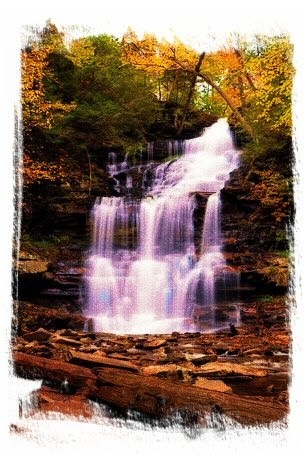 Cool Trail Tips: The main trail to see at Ricketts Glen are the Falls Trails. Round trip utilizing these trails is approximately seven miles, and at times has a very steep decent or incline. Of all the trails in Pennsylvania to wear proper foot gear, The Falls Trails of Ricketts Glen are most definitely the ones. The constantly falling water can make some trail sections slippery, and slippery rocks and steep walkways have spelled disaster for those not paying attention or coming prepared. Bugs seem to be more prevalent from spring into July. August through September seems to be when the area is both less buggy and at it's most beautiful. In winter months the falls are closed off to all but those proven experienced with ice climbing equipment. It's possible to see all the waterfalls by following the Falls Trails, but if you are short on time - or afraid that you won't make the full trip around - Take the Ganoga Glen side of the trail first, so you can see the largest falls at least. Another idea if you have a few people doing this adventure, is to leave someone's car at the parking lot located on Route 118. Then hike down, past Waters Meet and ride back up to your campsite! For more about Ricketts Glen State Park, read here, or check out the PA DCNR site. You have to pay a fee (or be a member) to hike these trails, but it's for a good cause, and totally worth it. Hawk Mountain is the location to see hawks, eagles and other raptors, also known as birds of prey. 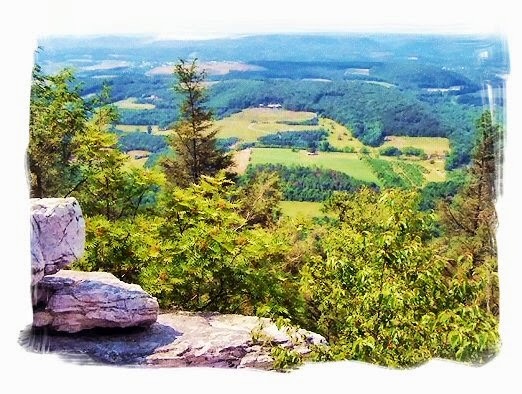 Hawk Mountain is actually a ridge of mountains, part of the Appalachian Mountain chain. It is not a state or federal park, but a member-supported wildlife sanctuary operated by the Hawk Mountain Sanctuary Association. The fee you pay (as of this writing $6 or $8 for adults with breaks for children and seniors depending on time of year) helps fund research, education worldwide, and operations within the park. There is no campground located at Hawk Mountain, but you can find local campgrounds nearby. If you have children, Robin Hill RV Resort located in Lenhartville PA has a pool and other activities to keep the kids happy, Our personal favorite is Pine Hill RV Park, located in Kutztown, PA. Both have campsites with full hookups, and cabins available. For us, since Pine Hill is located right next to a small farm, it seems like the quieter and more relaxing campground of the two. Pine Hill RV Park also happens to be a mile away from Pinnacle Ridge Winery which is a wonderful local vineyard. Stop to sample some award winning vino in their tasting room! Cool Trail Tips: When you arrive at Hawk Mountan, your first stop should be to the Hawk Mountain Visitor Center. You can pay the trail use fee, and check out the large relief map of the area to see where you will be hiking. The Visitor Center also has a great gift and book store, proceeds which benefit the sanctuary. Don't forget to get trail maps. (free with your trail use fee) Our personal favorite hiking end point is the North Lookout, the highest point on the ridge. We enjoy watching the raptors glide on the updrafts from the mountain.. You might like to pack a snack or light lunch to enjoy while relaxing on the large boulders dominating North Lookout. Please remember, whatever you pack in, you are required to pack out - back to your car. Being an eco-sensitive site, there are no trash containers available at Hawk Mountain Sanctuary. Parts of the trails can be rocky, so we'd advise against flip-flops, but sturdy sneakers or walking shoes should get you where you want to go. There are parts of the trail that are a steep climb, and parts you will be hopping boulder to boulder, but if you made the hike to that point, you're in for some spectacular views. Along the hike you may have the opportunity to meet resident and interning raptor experts. People studying or researching raptors coming to Hawk Mountain from around the globe. Most times they love to answer questions and get the truths of these majestic hawks, falcons, eagles, and others out there! Nestled in Penn's “Greene Countrie Towne,” is Fairmount Park, Philadelphia's emerald gem of forested land. One of the largest urban green spaces in the country, Philadelphia's Fairmount Park consists of more than 9,200 acres of trails, woodlands and wetlands. It actually is an amalgamation of over sixty parks within city boundaries, interconnected throughout Philadelphia. The Park cuts a big swath of green from the center of the city, reaching outward toward the Northwestern and Northeastern suburbs. It follows the waters of the Schuylkill River, Pennypack Creek, Wissahickon Creek, and other smaller tributaries. Hiking in these green spaces is a great way to explore natural, historical, and other treasures found in the City of Brotherly Love. If you have the stamina, the Fairmount Park trails connect with suburban Rails-to-Trails, make it possible to Hike or Bike from Center City, to Valley Forge, and beyond. Am I really hiking in a city? Throughout Fairmount Park there is the ability to hike or bike through parts of Philadelphia, and not even realize you are in the city. In places the bustling noise of the city gives way to the sounds of babbling streams and chirping birds. The experience can be as if you suddenly dropped off the city map. In the early morning and early twilight it's possible to see deer grazing, and chipmunks, rabbits, or groundhogs scurrying about. Even fox have been spotted hunting in sections of the park. Though many trails are not marked, they are defined and well traveled. The Schuykill Trail follows along the Schuykill River, and in places is along streets and sidewalks. To feel more in the wilderness, hike in the Wissahickon Gorge, located in the Northwestern part of the city The main hiking path there is known as Forbidden Drive. No motorized vehicles are allowed passage on the graveled path of Forbidden Drive. The only exceptions are for emergency or park employees. 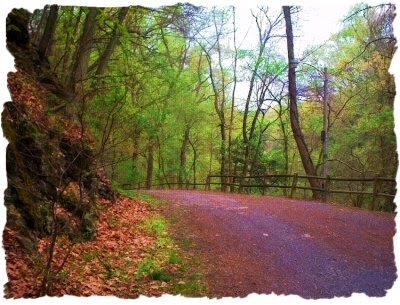 While hiking in the Wissahickon Valley, you will meet equestrian riders and bicyclists, but since the way is as wide as a two lane street, sharing is not a problem. Dogs are welcome here, but must be leashed and under the owners control. Hike past Art Art installations abound in Philadelphia. It's possible to hike from the Ben Franklin Parkway, past the Art Museum, along Kelly Drive, and toward the Wissahickon trail and enjoy over fifty installations of various art pieces and historic statuary. Hike past History Though Center City Philadelphia is the home to famous treasures and landmarks, like the Liberty Bell, Independence Hall, and Read Terminal Market; Fairmount Park has lesser known historical attractions of it's own. 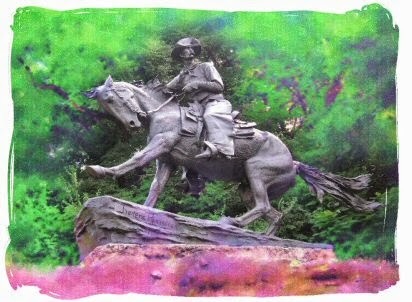 Chief Tedyuscung - controversial monument to a famous Lenape Chief, the Thomas Mill Covered Bridge - only covered bridge still standing in city limits, Hermit's Cave and more are all accessible from Forbidden Drive. Many historical homes, churches and landmarks are close by the trails. Hike to an Eatery When hiking in Fairmount Park, you don't necessarily have to pack a lunch or snack to take along with you. There are possibilities near - or even right on - the trails. We do however recommend you stay hydrated and carry a water bottle with you. Located by the western terminus of Forbidden Drive, Northwestern and Germantown Avenues, is Bruno's Cafe, with plenty of seating to relax and chow down on favorites like breakfasts, burgers, fries, milkshakes with dessert in the attached ice cream parlor before hitting the trail again. Or park at the historic Valley Green Inn for snacks and beverages at the takeout window, or; be seated and partake on the porch or dining room and be served something more fanciful to fuel up for your hike. For real variety in cuisine, if hiking on Kelly Drive, check out the noshing options located by Boathouse Row. Hike to Manayunk and it's canal path trail, and along Main Street you'll find the latest and hippest places to grab a bite or drink. For good food cheap, Union Taco is our current favorite in Manayunk. Philadelphia is a hiking and exploring paradise with the exception of one thing for RVers. There are no campgrounds in the city. The closest campground to serve Center City to the east is over the Delaware River in New Jersey, Timerlane Campground. To the south of Philadelphia, next to the Brandywine River, is West Chester KOA . We've personally enjoyed staying at West Chester KOA when we visit the Chester County area. A real restful place to camp - and they have a shuttle/tour to Philadelphia. Another idea is to contact friends in the city. Depending on where they live in the city, you may be able to "boondock" for a night or two in their driveway while you explore. For the more adventurous, contact one of the many churches in Philadelphia and check if you could boondock on their parking lot for a night. Those in the Northwestern section of Philadelphia or nearby suburbs may be more palatable to your request. Cool Trail Tips: Forbidden Drive is the only trail we'd ever say is "OK" to wear flip-flops. It's flat and well graded. We still recommend good sneakers or walking shoes, especially if you are planning to hike from center city using the Schuykill Trail along Kelly Drive and westward toward Forbidden Drive or the Canal Path in Manayunk. There are plenty of interesting spots to explore in "Penn's Woods". We don't recommend doing them at night however. In fact, many parking areas that access trails close at dusk. Forbidden drive is a relatively easy hike, but if you want to be more adventurous, try the smaller trails that branch off from Forbidden Drive, or are across the other side of Wissahickon Creek. 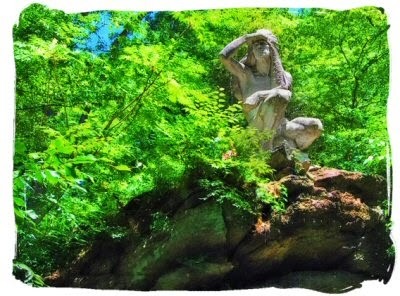 One of the great things about hiking in Philadelphia is you are never more than a mile from a major road or bus stop! If you really get tired, you can even call a cab! Happy Hiking! We'd love to learn about where you camp and hike in Pennsylvania. If you have some tips of your own, the RoadAbode Crew would love to hear them - comment below!